The world of graters has changed a lot since the rusty box grater my mother used. Now there are so many styles, you could have a whole drawer full of them and still not own every possibility. The Japanese grater from Chubo Knives ($49) is different from the usual American-style of grater. Instead of the grated material falling through holes in the grater, with an "oroshigane" Japanese grater, the grated material stays on top. These types of graters are designed for grating wasabi or ginger, but it works just fine for any vegetable with a similar texture, like garlic, horseradish, or even carrots. 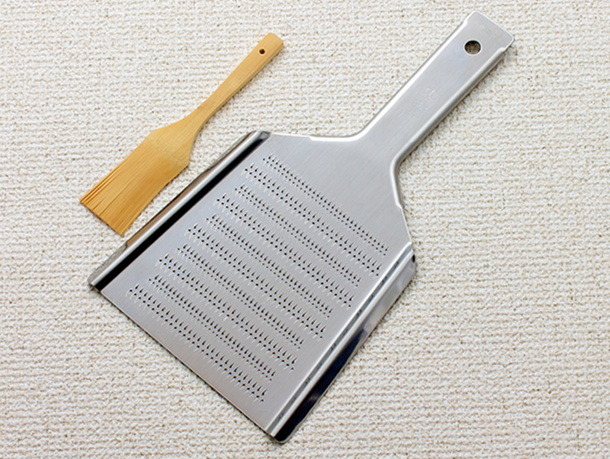 The Chubo grater is two-sided. The finer teeth on one side reduce the grated vegetables to what's nearly a smooth puree. The slightly larger teeth leave just a little more texture. While a sharkskin grater is more old-school for grating wasabi, the nice thing about this grater is that it's made from stainless steel (the product description says it's aluminum, but the one I received was stainless), so it can be cleaned in a dishwasher. What I thought was interesting was that even on the finer grating side it pretty much rinsed clean, so I wasn't picking bits of things out of the teeny sharp teeth. I don't know if I'll ever need to grate fresh wasabi, but ginger, garlic, and radishes, and onions are a lot more likely. This grater is made in Japan and the one I received was shipped directly from there. While the packaging looked cool, the downside was that everything was written in Japanese. I can't imagine there was any critical information there - I mean, it's a grater, so it's not too complicated.